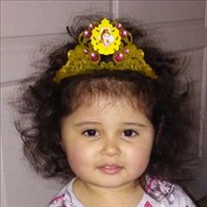 Natalia Jae Montoya, 2 of Exeter, California, passed away on Monday, June 25, 2018, in . Services have been scheduled with Salser & Dillard Funeral Chapel. A Memorial Tribute can be offered by logging into www.salseranddillard.com. The family of Natalia Jae Montoya created this Life Tributes page to make it easy to share your memories.